“Collision coverage will help drivers recover their losses if their cars are damaged by other vehicles or objects in accidents they are at-fault”, said Russell Rabichev, Marketing Director of Internet Marketing Company. Compare-autoinsurance.org has launched a new blog post that explains what types of events are covered by collision car insurance. 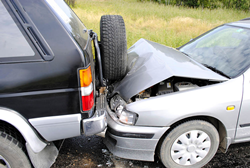 Collision insurance is a type of coverage that will reimburse the policyholders for damage sustained to their vehicles, due to the fault of the policyholders. As the name suggests, this coverage will pay only when a collision happens. The policyholder hits another vehicle. In these situations, policyholders are obliged to stay at the place of the accident, or else it will be considered a hit-and-run incident. Drivers are recommended to take photos of the damaged vehicles and search for witnesses that can properly describe what really happened. As soon as possible, drivers should report their accidents to the insurers. The property damage liability component of the minimum required insurance will pay for the damages sustained by the vehicle that was hit by the policyholder's vehicle, and the collision coverage will reimburse the costs to repair the at-fault policyholder's vehicle. The premiums can increase with as much as 40% after an at-fault accident. After multiple at-fault accidents in a short period of time, the insurers will cancel the policies of at-fault drivers. The vehicle hits an inanimate object. Policyholders can file a claim after they hit a tree, a fence, a lamp post, or even a pothole. These types of accidents are considered at-fault accidents and the policyholder's insurance premiums will increase. Objects that lay on the road or near the road are seen as avoidable obstacles. If the damages sustained by the vehicles are too small, drivers should not file a claim. The car rolls over. Rollovers are accidents where vehicles flip over onto their sides or roof. These types of incidents occur when a vehicle hits another vehicle, object or when a vehicle takes a curve with high speed. Although all passenger vehicles are susceptible to rollovers, SUV’s and pickup trucks rollover incidents are more likely to happen. Rollovers accidents are expensive and it’s not uncommon for the involved vehicles to be totaled. In these cases, insurers will reimburse the policyholders that have collision coverage with the actual cash value of their vehicles at the moment prior to the accident. However, if the rollover accident happened because the policyholder was driving recklessly, insurers can deny paying any losses.